I have to admit that a lot of the newer shows that have come out in recent years haven't exactly thrilled me. I'm not sure if it's just a question of taste or a decline in quality overall, but the new TV shows that I genuinely enjoy seem to be a lot fewer these days. And I'm also making more stern decisions about quitting shows that just aren't going anywhere. And believe me, there have been quite a number of them. Penny Dreadful is one of those shows that felt rather refreshing compared to the rest of what TV had to offer. Sure, it's not necessarily a perfect series nor is it one that I can call a sort of favorite. But it is oddly fascinating and I'm honestly hopeful for what the next season may bring to the table. The buzz around this show was a little low-key to begin with - not much more than some geeks being excited about casting choices and whatnot. However what we had little information on was the plot of the show itself - we had little to no idea what the show was going to be about! All we had to go with was the title. And quite frankly, this still worked in the show's favor since it limited preconceptions or biases related it. 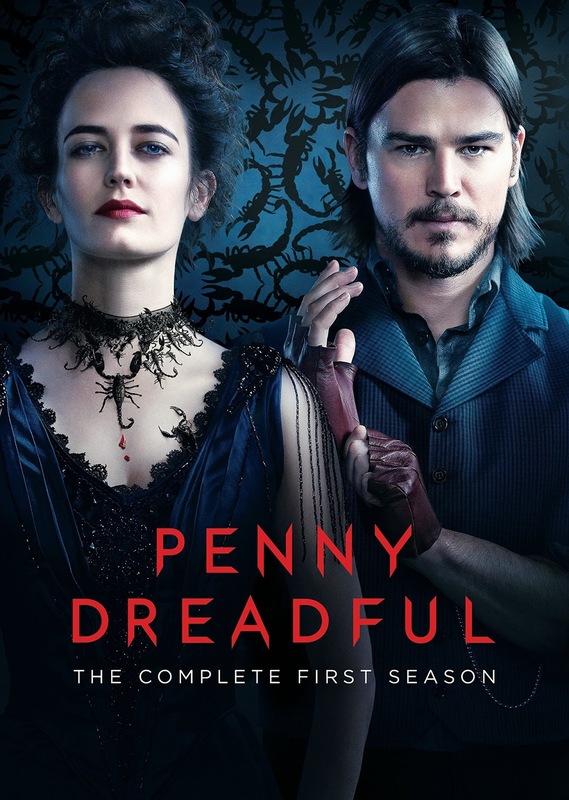 Synopsis: Penny Dreadful is a British-American horror drama series created by John Logan. The show airs primarily on pay-TV network Showtime and this first season only runs for a total of 8 1-hour episodes. The show is set in Victorian England featuring a number of familiar characters of fiction. One of the first characters that really stands out is Vanessa Ives (Eva Green) recruits con man and gunslinger (Josh Harnett) to aid in some "night work" together with Sir Malcom Murray (Timothy Dalton). Murray is practically obsessed with locating his missing daughter, Mina Harker (Olivia Llewellyn). And thus he and Vanessa continually pursue leads related to her location - leads that typically involve facing creatures that can only be described as vampires. The later enlist the aid of Victor Frankenstein (Harry Treadaway) to help with the analysis of a vampire corpse they manage to secure. But of course he has his own story - one that explores testing the limits of human science and breaking past the barrier between the living and the dead. The story gets further complicated with characters like the prostitute Brona Croft (Billie Piper) and Dorian Gray (Reeve Carney). Before you even ask, no, this is not a TV version of the movie adaptation of Alan Moore's League of Extraordinary Gentlemen or anything even remotely like that. And while the story does include a number of popular characters derived from Victorian fiction, it is not bound by this and more characters are actually completely original. It's just rather fun to have them here - it is still a penny dreadful after all in the classic Victorian sense. As expected, Eva Green does quite a lot to really set the bar in this show given her intensity in bringing her character to life. Vanessa Ives is quite the enigmatic figure and is presented as a classic mentalist given her ability to read the future using her tarot cards and her mysterious ties to the darkness beyond our reach. There's that moment when we are first show the vampires that we see how Vanessa has a mysterious hold over the vampires - enough to stop one in its tracks. And the nature of this darkness within her is one of the key plot threads that carry through all the episodes and only really gets resolved by the end of the season. Timothy Dalton is always going to be a little campy - he has quite the flair for the overly dramatic. But his inclusion in the cast rather worked out well and it really does make sense in terms of the greater scheme of things. He's a lot better here as a man looking for his daughter compared to the power mad Time Lord Rassilon in Doctor Who. You certainly feel his pain given he knows that the chances that Mina is still safe, alive or even human are pretty slim at this point. But naturally he is determined to learn the truth and is scarily willing to do anything and use anyone in order to achieve that goal. Frankenstein's arc is certainly interesting apart from the main story with Malcom given it's the classic Frankenstein conundrum with a bit of innovation thrown in for good measure. And the fact that him bringing a corpse to life at the end of the first episode was pretty jarring but ended up being barely the tip of the iceberg of his whole narrative arc. And the way things progress and the challenges he has to face work out rather well. There's a lot of WTF moments in the show that range from the mind-blowing to the absurd, but it all works. Penny dreadfuls were always full of such embellishments and exaggerations and the willingness of the team to do so in a manner that keeps the story coherent is worlds better than what we see in shows like American Horror Story. Here's a more mature take on the genre that employs similar tropes but in a clever, more creative way. And while not all characters are created equal, the show does appear to have some rather solid writing involved together with brilliant visual direction. The show has the feel of a horror story with all the dark shadows and pale-skinned characters trying to fight against horrors well beyond human comprehension. And thus it remains rather fun. Penny Dreadful has already been confirmed for a second season, which is a very good thing indeed. It's a nicely novel little show and I hope they manage to continue to improve the writing and strengthen the character development in the next season. Thus this first venture out certainly deserves 4 dark spirits that seem to torment Vanessa Ives out of a possible 5.